The National Inclusion Project is a non-profit that bridges the gap between young people with disabilities and the world around them. 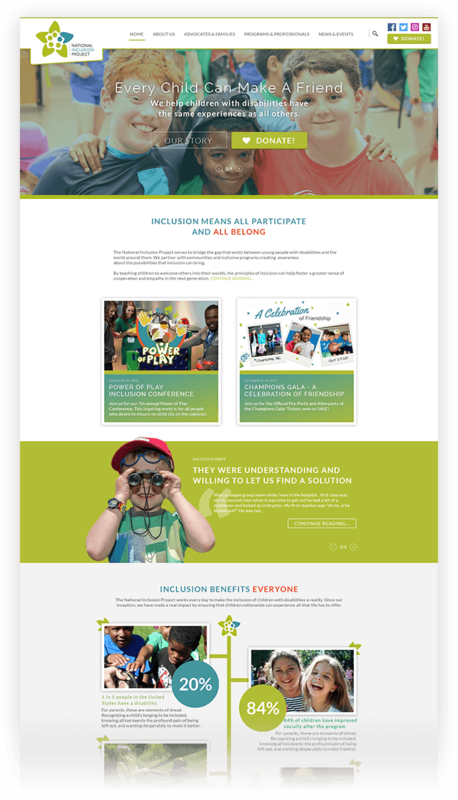 The National Inclusion Project has a dated website that's hard to find information and doesn’t have a clear explanation of “what we do.” With advancing technology and the rise of social media, the National Inclusion Project needs to redesign their website to align with the goals of the organization and their target audience. The National Inclusion Project requires a site that functions as a powerful marketing and communications tool to attract new sponsors, practitioners, and advocates and to position itself as a leader in the community. We designed a new mobile-friendly website that provides a simple navigation for visitors with a clear explanation of "what we do." We included testimonials and success stories incorporating rich media to tell the story of Inclusion with a clear call to action. The updated website is using custom WordPress theme.